We went to Paradise Garage on a Wednesday and had an early table booked for 7pm. It was already pretty busy then, and was absolutely heaving half an hour later. 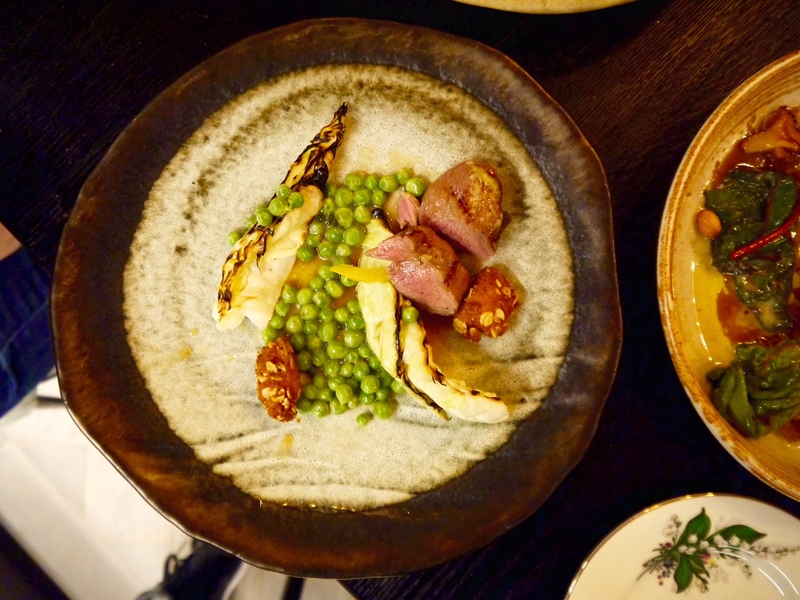 If you want to go to Paradise Garage, which I suspect you will once you've read the rest of this post, then make sure you book. Well in advance. I was there with three mates, none of whom I could convince to share the rabbit picnic (a whole rabbit that serves 2-4 and comprises roast saddle, confit leg, rabbit pastry, offal and scratchings with sautéed chicory, capers, radishes and artichoke piccalilli). Instead we ordered most of the snacks section (slightly smaller than a starter) and various dishes from the garden, sea and land sections (slightly larger than a starter), all to share. Things got off to an excellent start. 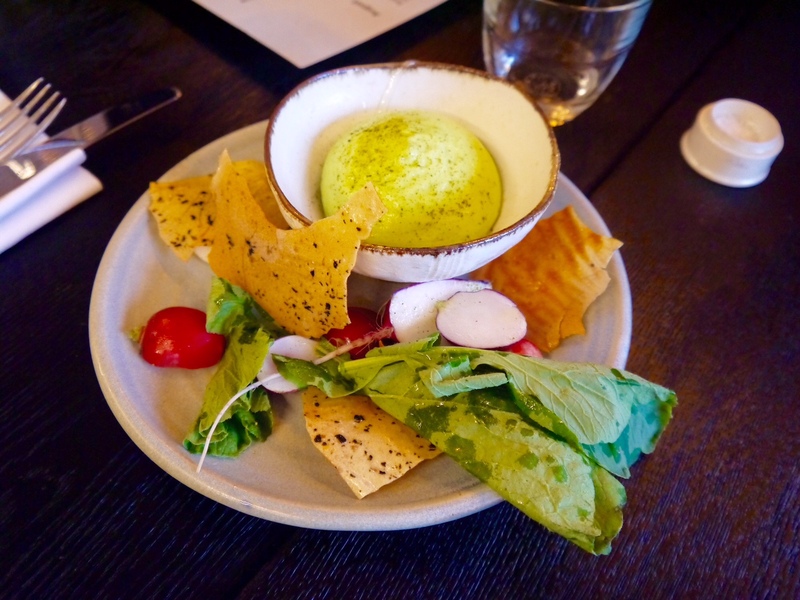 A pot of light green, fluffy pea mousse was brought to the table with radishes and their leaves (which I adore) and the thinnest potato crisps I've ever seen. This was quickly followed with bread served up with smoked whisky butter, which we devoured in seconds. 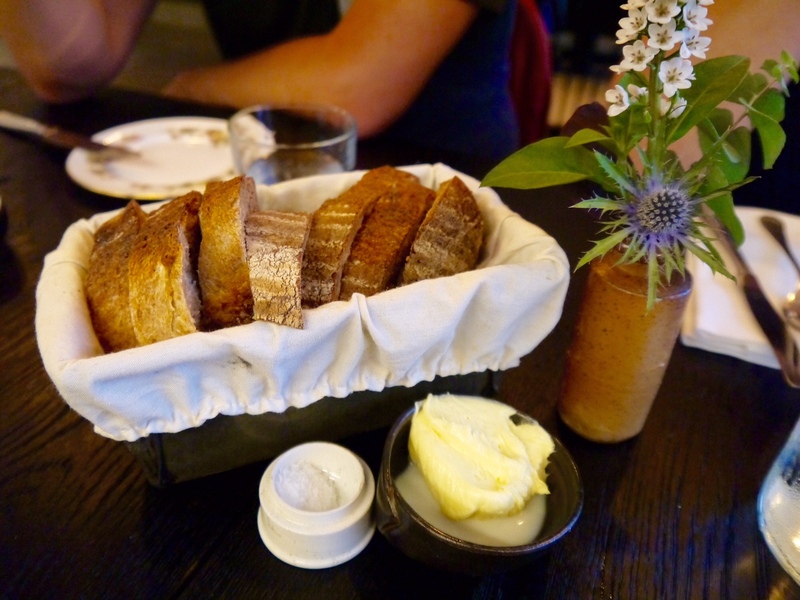 The bread and butter had a hint of whisky, smelt like bonfires and tasted utterly divine. Snacks are served as they're ready, so start with the cold dishes. We had the beef, beer and horseradish salumi; and the pork, black pepper and apple salumi, both of which are made on site. They had great flavours and a really nice texture that wasn't at all greasy or gristly, and I think my favourite was the beef, beer and horseradish. Also from the snacks menu we had Cornish crab, kohlrabi, apple and grilled lemon - our least favourite due to a lack of strong flavour, it just didn't quite work for us. 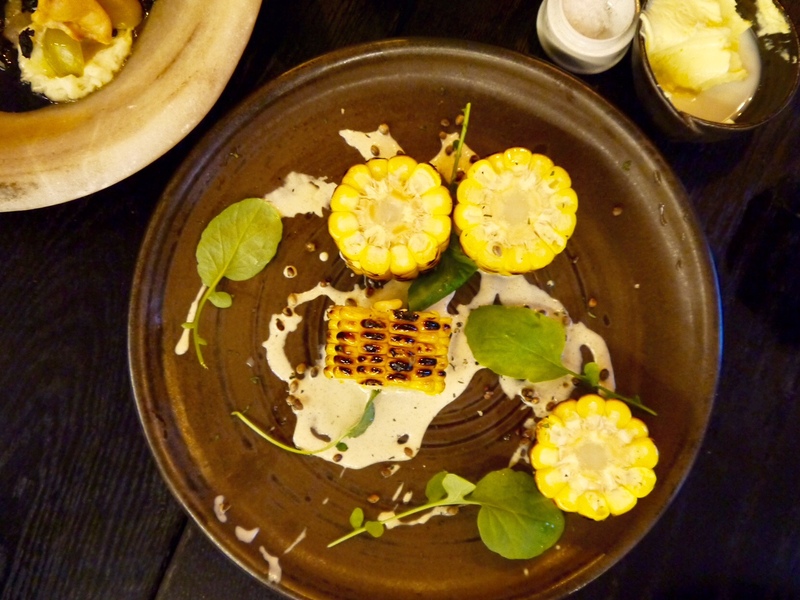 Grilled sweetcorn, hemp seed and creamy sauce, which was incredible - the crunchy seeds glued to the charred corn with the creamy sauce were a fabulous combination of flavour and texture. 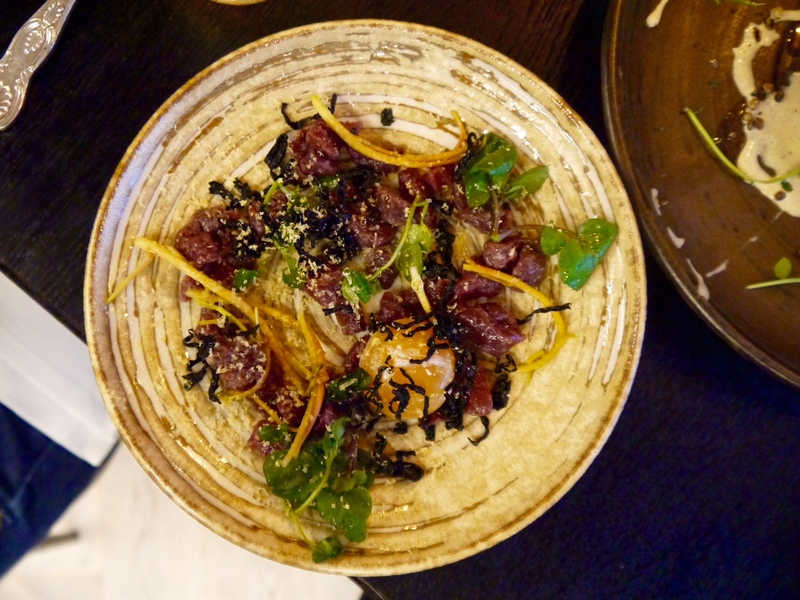 Venison tartare, preserved egg yolk and watercress - which I ate nearly all of myself and loved the fact that the venison shone through without having to fight against a strong sauce or pickle flavour as with so many tartares. 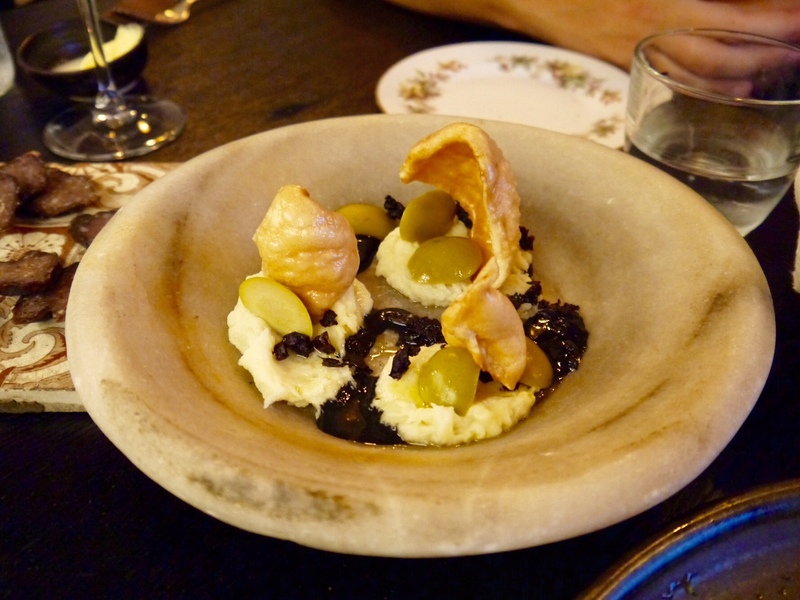 And finally the salt cod brandade (salt cod emulsified with olive oil to give a pate type consistency), squid ink, olives and shellfish crisp, which was an all round winner - the salty cod was given depth by the squid ink and the delicate flavour of olive. 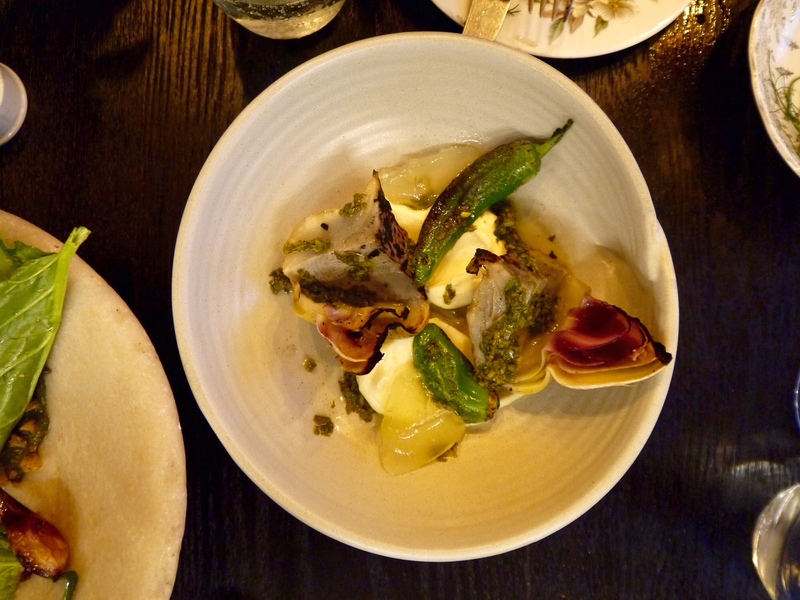 From the 'garden' we had the globe artichoke, padron peppers, fresh curd and lemon jelly. I really liked the artichoke, curd and lemon jelly together, and though I'm a fan of padron peppers I'm not sure they worked on this dish. A dish that definitely did work from the 'garden' section was the egg, charred grelot onions, spinach puree and lardo. 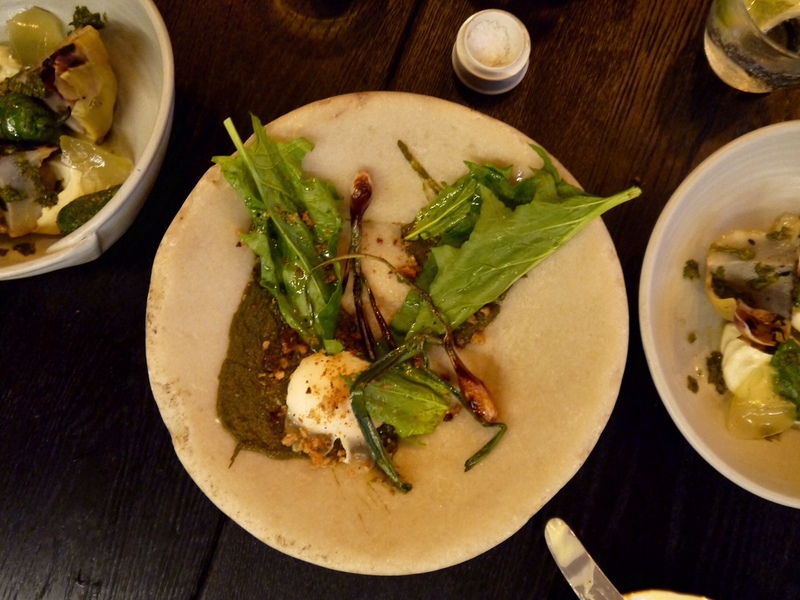 What a fantastic dish - the spinach puree was so good, mixed with the runny egg yolk and lardo, I could eat this for breakfast every day! 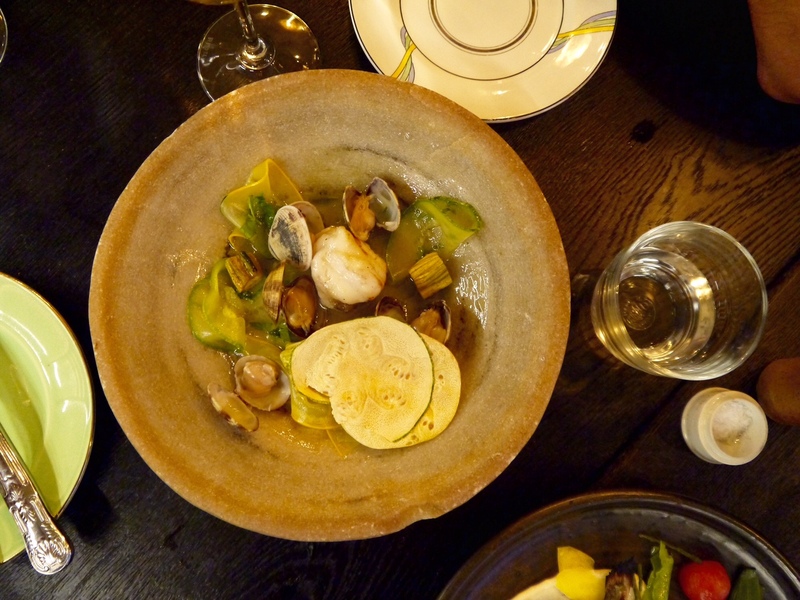 'Sea' wise we chose the monkfish, clams, courgettes and herb oil which was fresh and zingy, with all the elements cooked perfectly. 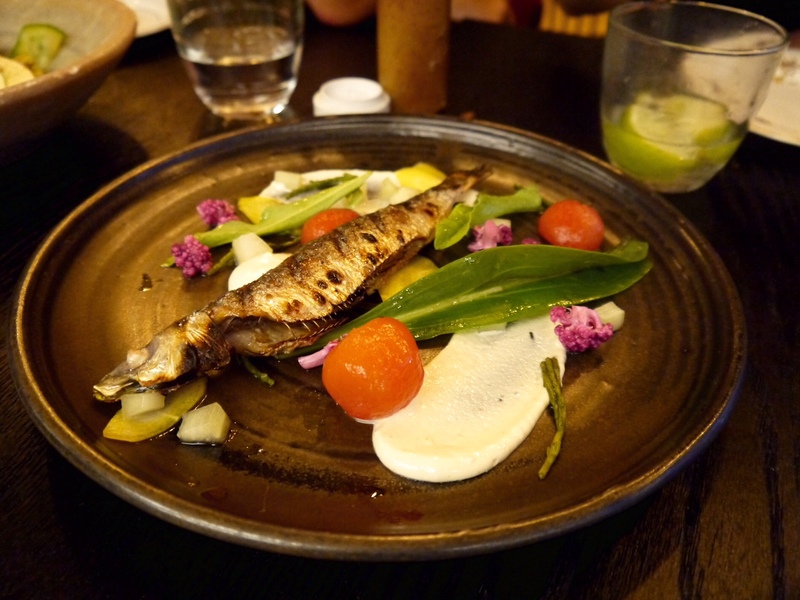 And charred Cornish sardine, cod roe, pickles and rice crackers, which I loved. 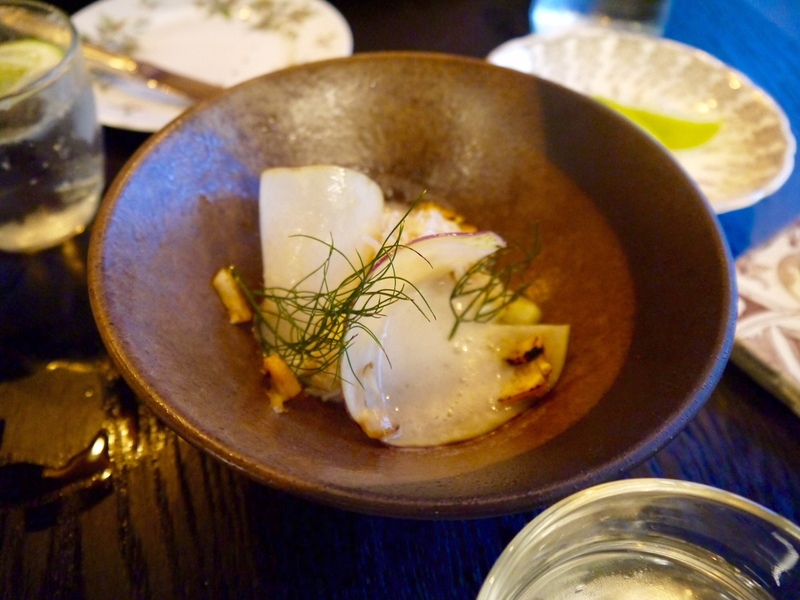 The fish skin was, as it said it would be, charred, and the fish inside so delicious - the oiliness lifted by the pickles and smear of cod roe on the plate. Finally (and I didn't remember eating all that food until I was writing this and realised I had soooo many photos) we were on to the 'meat' section, from which we had one of each. I think these plates were my absolute favourites - each one with its own highlight. First was the white park beef, mushrooms, chard, miso and hazelnuts. The beef perfectly pink, and complemented by everything on the plate. The meat had a depth of flavour that tasted like it had been aged for well over 30 days. 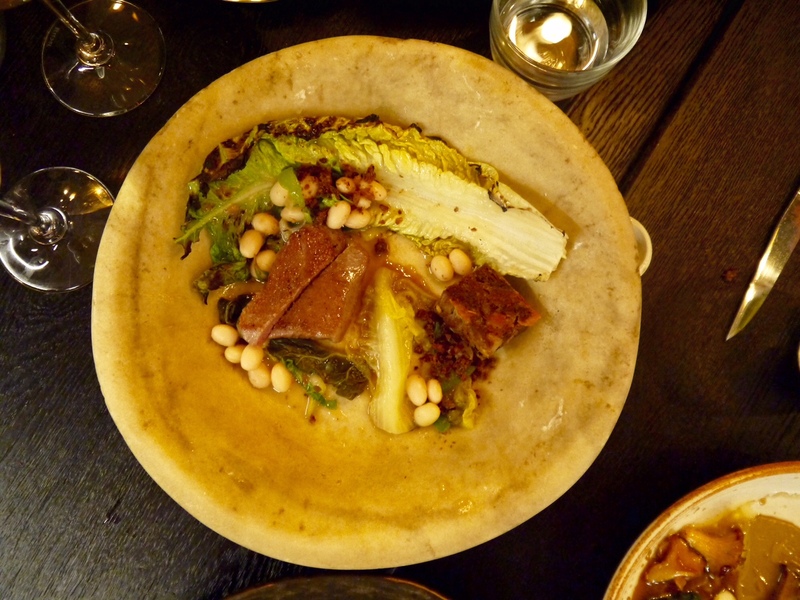 The Iberico Presa, slow cooked pig head, coco beans, anchovy and lettuce was a winner with the whole table. Again, the quality of meat was amazing. 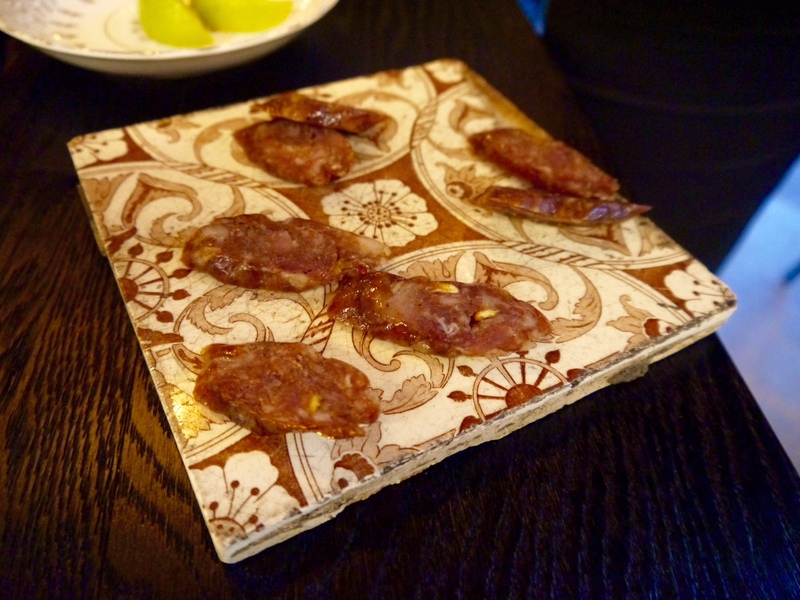 Places like Paradise Garage are examples of why we should only eat the best quality meat we can get - it makes such a difference to a dish when the meat is that flavoursome. 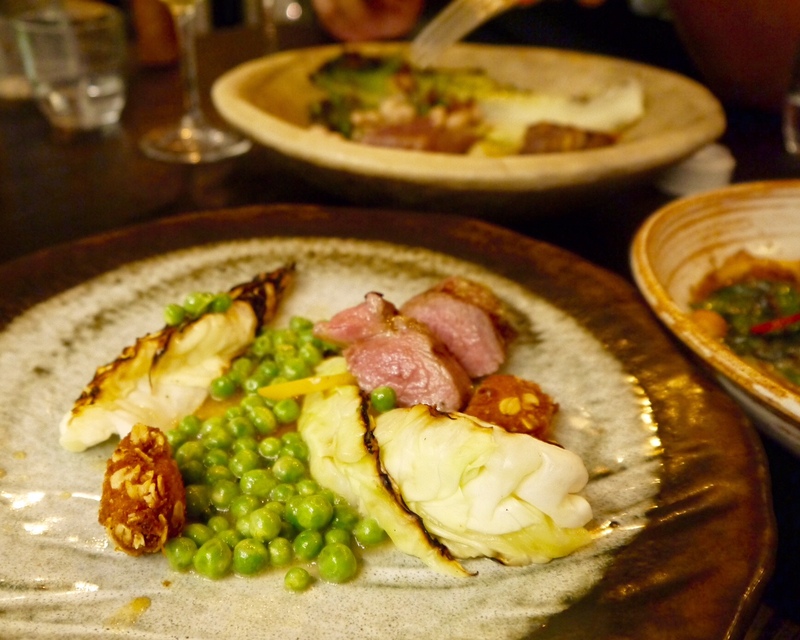 Last but by no means least was Welsh lamb rump, lamb's fry, cabbage, peas and preserved lemon. By this point I have no more words to explain how good it all was! The lamb's fry (offal) coated in oats and deep fried, with the cabbage and pink rump is worth going back for alone. Now that I've tried Paradise Garage, I really can't wait to try The Dairy and The Manor, and will make sure I do very soon! For more on Paradise Garage, check out their website here. Dishes range from £5-7.50 for snacks, and £7.50-12 for the other dishes, so if you go with a group, and order a bit of everything, with wine I reckon you'll spend £45-60 a head. I think that's incredibly good value for the food you're getting. And the service, which was so relaxed, but not in a sloppy way - we didn't feel pressured and hassled at all, but there was always someone there when you needed them (normally to clear empty plates and make way for more food!) 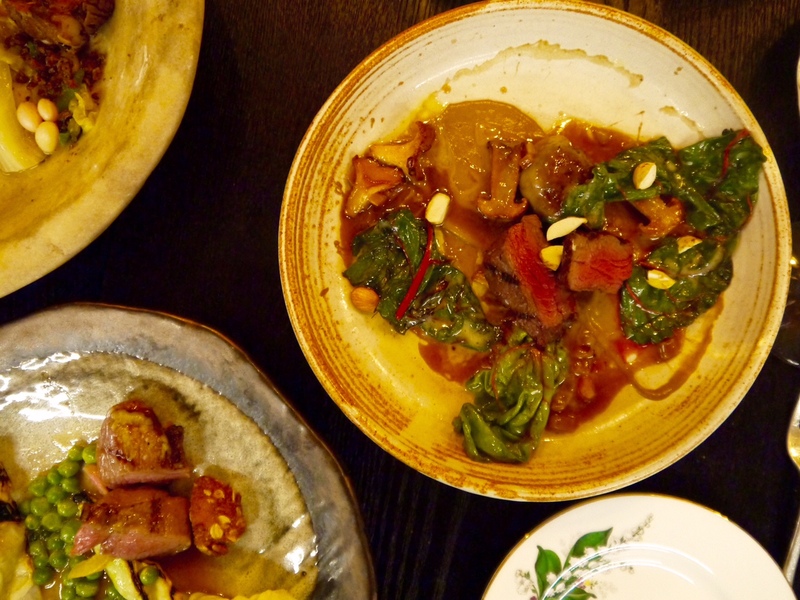 It's not often a restaurant this good comes along, so go, eat everything, and then go again!! 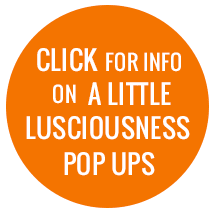 It's SO fabulous Amanda, an absolute must visit! I had to pretty much roll home! SO much amazing food!! It's brilliant Andrea, you must go. That sweetcorn dish was excellent - I wasn't expecting to like it as much as I did. 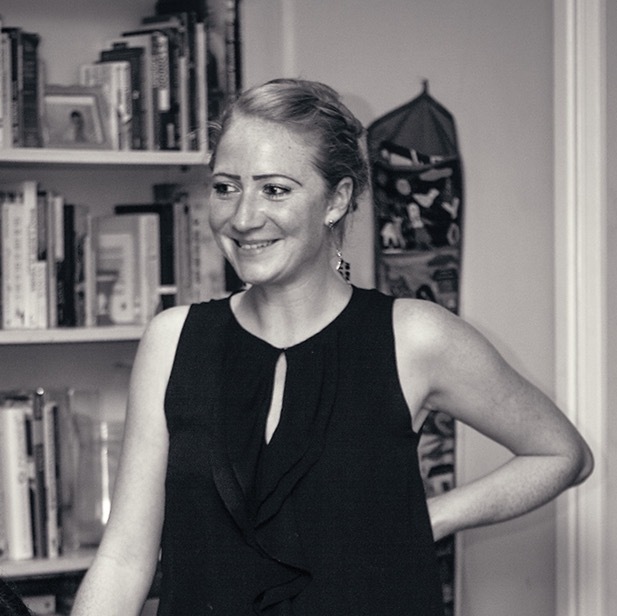 Definitely worth a trip back East Megan :) Where have you moved to? The sweetcorn looks soooo good, I'm a meat lover and yet all I can think about now is that sweetcorn! Great review. Thanks! I know, the sweetcorn was so good. Could eat it all again right now!! Everything looks good. I need to get out to restaurants a bit more often at the moment. I would have probably eaten one of everything that you had too. AND I would have definitely ordered the rabbit too, but think you did the best option with the selection.